Congratulations to our lucky Spark Some Fun sweepstakes winners! BRP is collaborating with groundbreaking electronic artist deadmau5 to launch our latest product, the 2014 Sea-Doo Spark personal watercraft (PWC), with a live concert event. “Spark Some Fun Miami” with deadmau5 will be held at Fontainebleau Miami Beach on Sunday, March 23. This event showcases the spirit, fun and ingenuity behind the Spark model through a lively and colorful musical exhibition. To kick off the partnership, fans were invited to enter the “Spark Some Fun with Sea-Doo and deadmau5” sweepstakes. The grand prize is a 2014 Sea-Doo Spark paired with a Move I Trailer and a trip for two to the exclusive “Spark Some Fun Miami” deadmau5 concert in Miami. 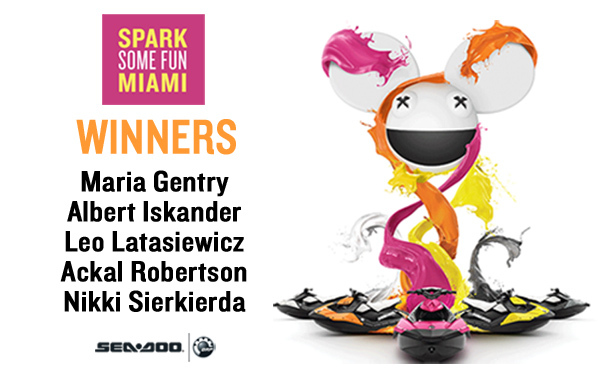 Maria, Albert, Leo, Ackal and Nikki, we hope you’ll enjoy your prize and make sure to “Spark some Fun” in Miami starting on Saturday! Stay tuned to watch for photos of the event this weekend!